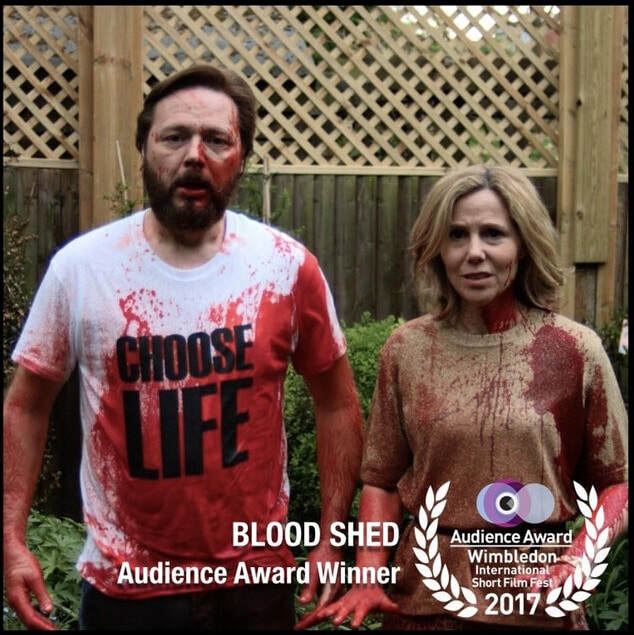 ​We're delighted to announce that... ​Blood Shed is now an AWARD-WINNING film! 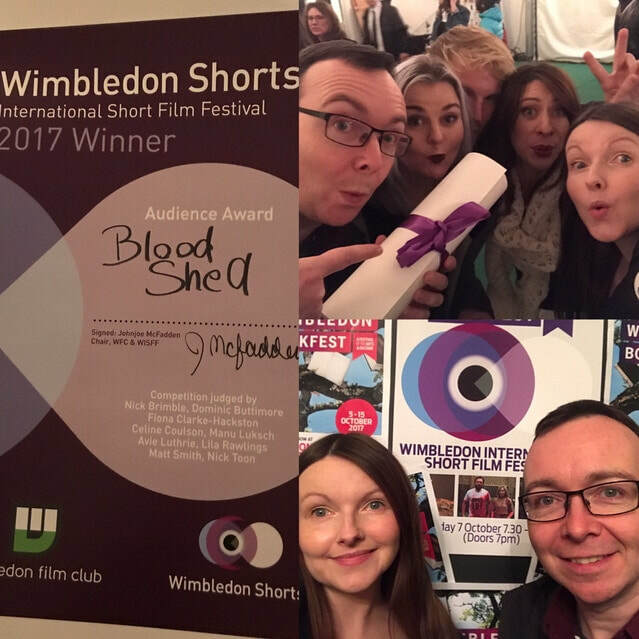 Yes, we scooped the coveted Audience Award at Wimbledon International Short Film Festival, fighting off stiff competition from films across genres. This means a lot to us as we love winning over the audience and making viewers happy - it's always something we strive for. ​ We had an amazing time at the screening, and were also nominated for the Best London Filmmaker award. There's nothing like hearing a big tent crammed full of people chuckle at a sweary man-eating shed film. ​Our little sheddy tale of guts and gore has brought us even more glory since then, notching up several more awards!  We were stunned to wake up to the news that Blood Shed scooped THREE awards at the prestigious Knoxville Horror Film Fest!  ​We were crowned Funniest Film, James Moran was named Best Director for a short, and we won Best Script for a short film, too. As Producer, Co-Writer and Production Designer, Cat is grinning from ear to ear and thrilled that our rather unique tale has found its place on the film scene so quickly. ​And there’s been even more glitz and glory for the film thanks to the amazing Sick Chick Flicks Film Festival in North Carolina! The festival team kindly picked our star, Shaun Dooley, as the winner of the Best Male Lead Award. Here’s a quick peek at the trophy that is currently en route – what a hot bird! We can’t wait to unwrap this little chick. 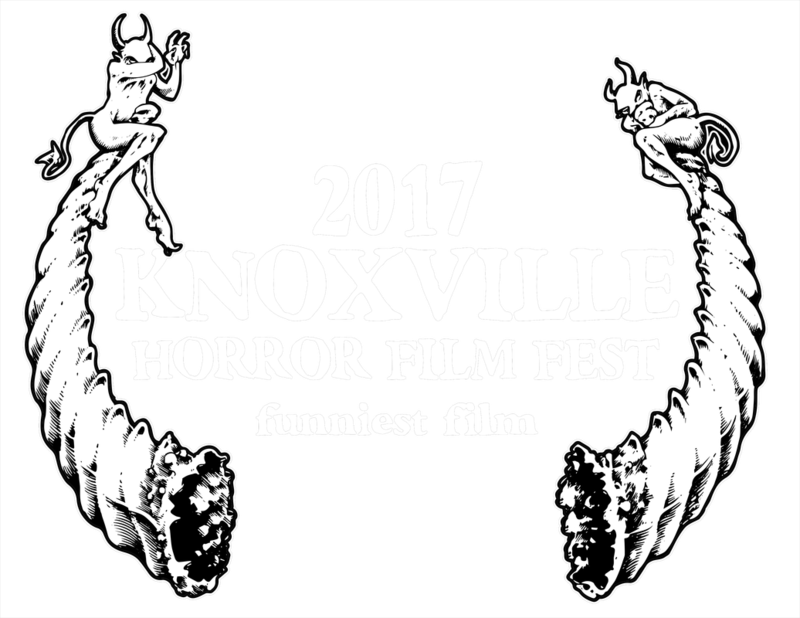 Huge thank you to these festivals and their judges, but also to our supporters who helped get this film made and spread the word about it. 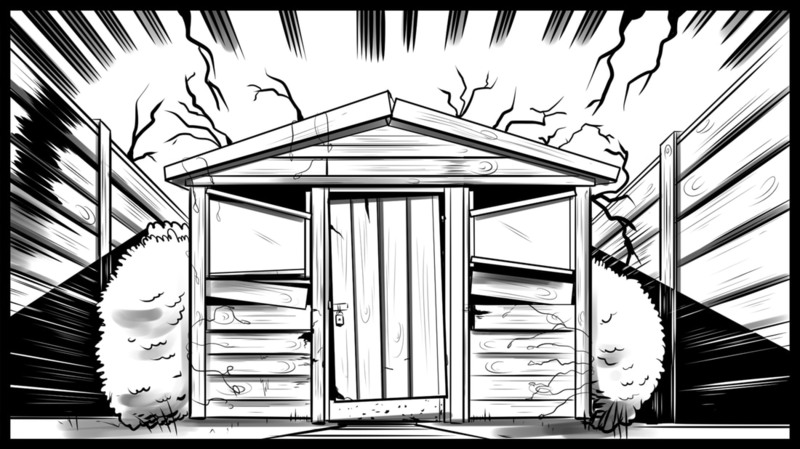 It’s an honour to share it with so many like-minded shed-fanciers. We have more screenings coming up. We’re screening at the awesome Ax Wound Film Festival in Vermont on Saturday 18th November, then we’re back in London on home turf for the Underwire Festival 2017 where we’ll be screening at the Prince Charles Cinema on Friday 24th November. Come and show your support if you can. Cat is nominated for their Best Producer award and at more than 8 months pregnant, she is extra, extra emotional about this nomination! In other news, James and Cat are guests on the latest edition (season 2, ep 7) of the brilliant film podcast Casting the Runes! 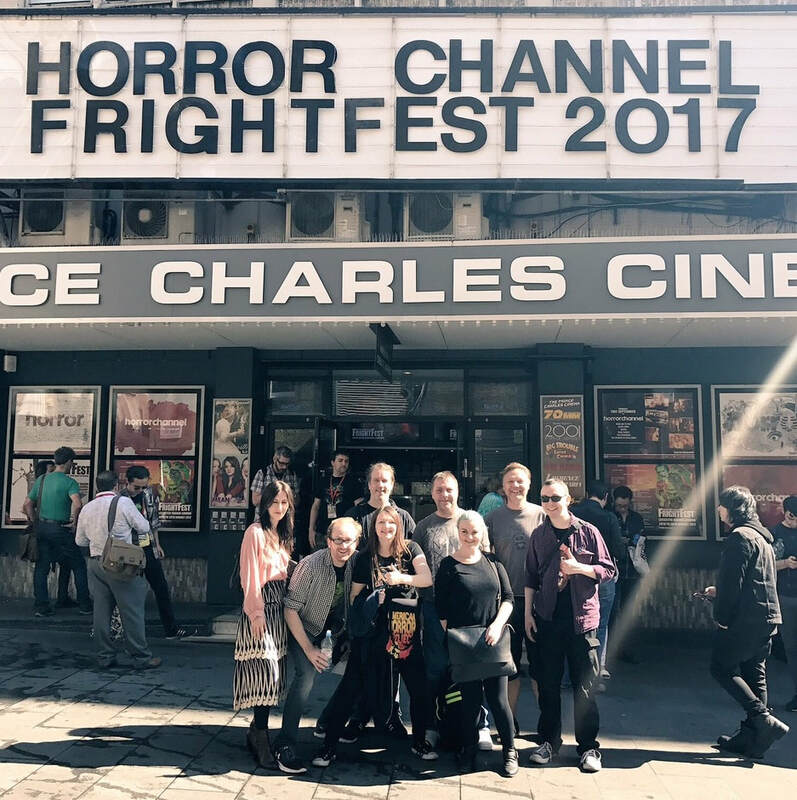 We were chuffed to chat with the lovely Runes team and had a great time talking about Creepshow and Blood Shed. Have a listen to the episode here! We hope you find the things we say insightful as well as plain odd, weird and strange. Trailer unleashed! Film completed! Merchandise coming soon! We have lots of news to share with you this week! First, Blood Shed is now complete. Hoorah! We spent lots of time lovingly and carefully crafting this uniquely beautiful demon baby, ensuring that the creative forces behind the film are super dooper happy. The film hits festivals this Summer 2017, and will be made available to our Kickstarter backers for viewing soon. Second, our trailer has just been unleashed! Here it is! Take a peek... If you dare! We hope this gives you an enticing, intriguing flavour of the tone, sound and look of the film. Enjoy! We also have a flurry of film festival news announcements coming this week! BIG news. Keep an eye on our Twitter page and Screenings page of our website for more details. We've been hard at work designing and ordering our official Blood Shed swag pack merchandise for supporters who pledged £100 or more. The merchandise will be strictly limited edition! If you want to get your hands on some but didn't pledge at the time, we may offer the occasional piece for competition prizes on social media, or at film festivals. A final comment from us - we were saddened to hear the news of the passing of the legendary George A. Romero. The man was a genius and revolutionary indie filmmaker, creating the zombie as we know and love it. Without his great work, our lives would be all the poorer and our Halloween costumes a lot less interesting. A special thanks to him for his tremendous gift of Creepshow, one of the primary influences for Blood Shed. RIP George. We've been hard at work putting the finishing touches to Blood Shed in the edit. The film looks and sounds fantastic, and we're looking forward to sharing it with you when it's fully completed! We can barely contain our excitement! BUT, we're delighted to finally reveal our OFFICIAL POSTER ARTWORK! This collaborative piece is the fruit of our labours with the fantastic Andy W Clift! We've been inspired by classic posters and VHS covers from the 1980s, including The Evil Dead, Swamp Thing, Friday the 13th, Fright Night and the Creepshow-style illustrations that also feature in our film. Feast your eyes on it! Complete with frames from the film showing our delightful stars Shaun Dooley and Sally Phillips in action! TARGET GOAL MET! 114% FUNDED! 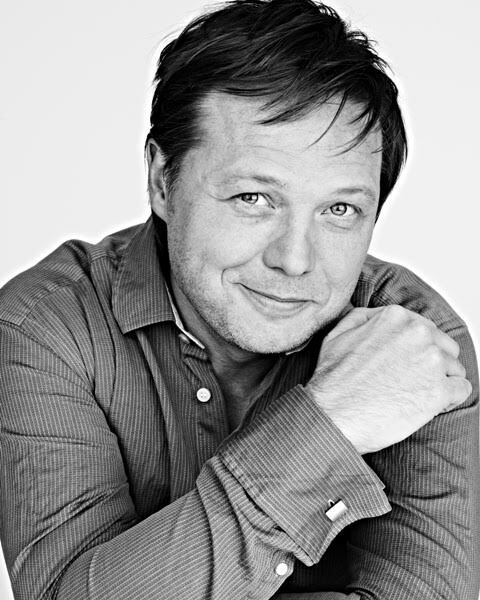 The award-winning SHAUN DOOLEY will play the role of Jack! Shaun is an amazing actor! SALLY PHILLIPS will play the role of Helen in Blood Shed! Sally is a comedy ICON and writer instantly recognisable as one of the forces behind Channel 4’s award-winning comedy sketch show, Smack The Pony. She has also starred in the three smash hit Bridget Jones films and The Decoy Bride, which she co-wrote, and HBO’s Veep with Julia Louis-Dreyfus! Sally has been a near-constant presence on British television, from I’m Alan Partridge, to Hippies, Green Wing, Miranda, and Parents. Sally co-starred in the 2016 film Pride and Prejudice and Zombies, as Mrs Bennet. Since 2004, she has played the title role in the BBC Radio 4 comedy show, Clare in the Community. 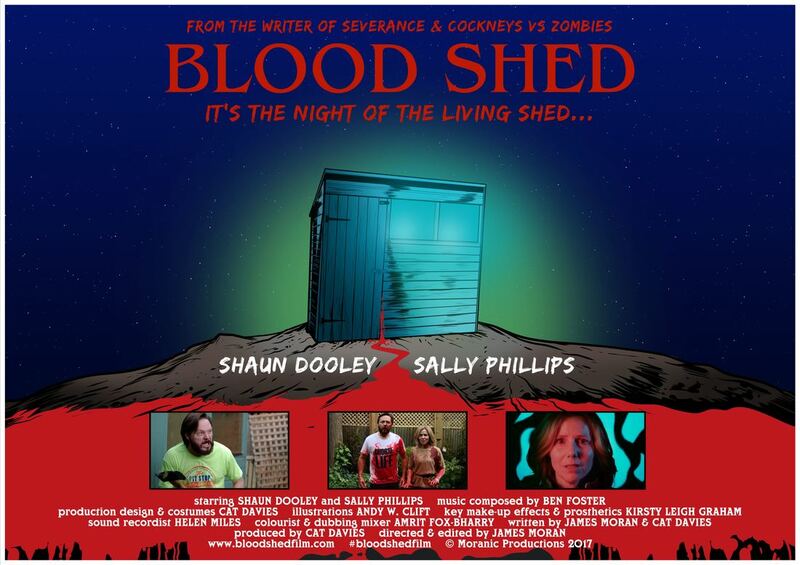 Sally is a tremendous talent and we’re thrilled to have her on board for our bloody SHED-anigans! 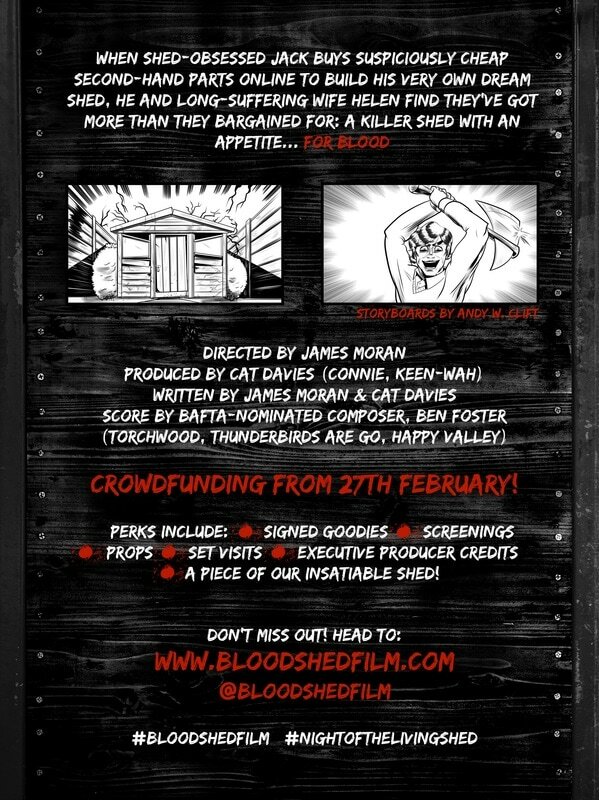 ​[Press Release] Blood Shed: Brand new short from the writer of movies Severance, Cockneys vs Zombies, Tower Block crowdfunding from 27th February - 27th March! 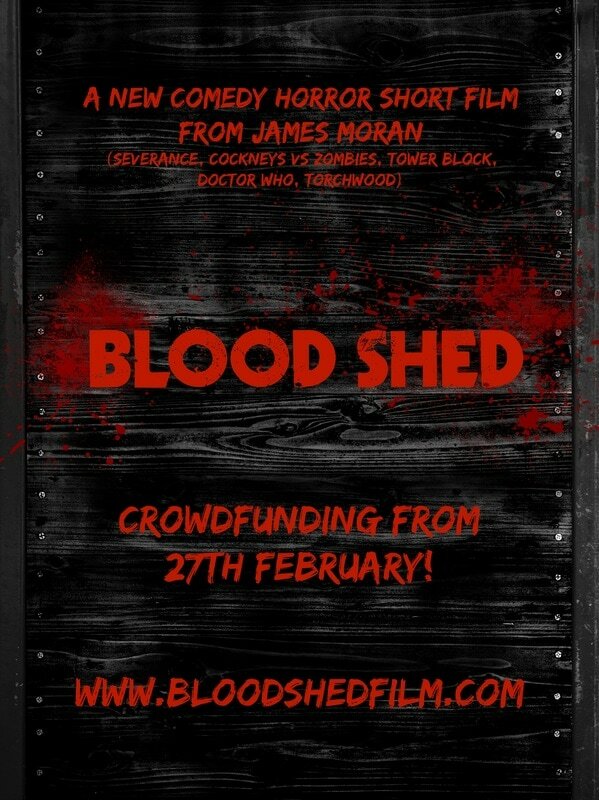 16/02 - Moranic Productions announce today the crowdfunding campaign for a brand new 10-minute short film, BLOOD SHED, from award-winning genre favourites! ​The team need to raise £10K to make this beautiful nightmare a reality, with a Kickstarter campaign live from 27th February - 27th March 2017. But they can’t do it without you! There are perks including signed goodies, exclusive extras and downloads, set visits, screening tickets, props, Executive Producer credits, writing workshops, script feedback, and even a piece of the shed! James Moran, co-writer and director, will already be familiar to many fans of the horror and comedy genre through his writing on the movies Severance, Cockneys vs Zombies and Tower Block, and internationally acclaimed TV shows such as Doctor Who, Torchwood, Primeval, and Spooks. His other work includes 5-time Streamy Award nominated web series Girl Number 9, and several short films which he wrote and directed, including the award-winning hit Crazy for You (Best Horror/Sci-Fi, Crystal Palace International Film Festival), starring Arthur Darvill and Hannah Tointon, which screened at huge festivals across the globe and is now part of an anthology feature film. The team’s latest hit web series, Mina Murray’s Journal won the Best Screenplay award at Dublin Web Fest 2016, and will soon screen at HollyWeb in Los Angeles. Signed goodies, exclusive extras and downloads, set visits, on-screen appearances, screening tickets, props, Executive Producer credits, writing workshops, script feedback and even a piece of the shed! With STRETCH GOALS to be announced!